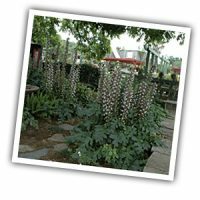 This plant makes a bold statement in the partially shady garden. Glossy, deeply lobed, medium green foliage forms an 18-30 clump. Spikes of striking, longlasting flowers appear in late spring through mid-summer and can reach 48-60 tall. The flowers look like little white hankies emerging from smokypurple calyces. This plant is stunning in large containers. This hybrid acanthus holds up in summer heat. Well-drained soils.